Abstract: So, with this in mind we took extra interest in this weeks product on our review chopping block. 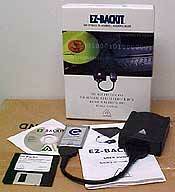 Namely the EZ-BACKIT - essentially a 12GB Hitachi 2.5" drive, PCMCIA card and adapter cable. In these terrible times, the unthinkable can happen at any moment. I'm talking hard drive failure. One moment you may be busy putting the finishing touches on a 6000 word report that is due the next day, the next you may staring at frozen screen.... Then the dreaded "no disk found," or similar error that puts fear into the hearts of many. All that data, all that effort, gone.... Times like those call for the foresight to backup data. It can't happen to me.... but it will happen to you! So, with this in mind we took extra interest as we put this product on our review chopping block. Namely the EZ-BACKIT - essentially a 12GB Hitachi 2.5" drive, PCMCIA card and adapter cable. For about $500 you get the 12Gb EZ-Backit drive, PCMCIA card, adapter cable, driver diskette, Backup software on a CD-ROM and instructions. Comes with a 3-year warranty. With portable backup devices, we're always interested in just how well they're made. If they break at the slightest touch, then there's really no point in storing your precious data on them is there? Looking closely at the EZ-Backit I see a few concerns almost immediately. I'm not too concerned about the plastic case, as it has a few vibration and shock reducing features built into it. I'd guess it could stand a fair sized drop with no ill effects - but I'm not about to test that out - sorry.